← A battle of wits! I was heading to work this morning, when the call came in. “We have a problem,” said my mother on the other end of the line. I knew immediately who the “problem” was. “Someone greeted me at the front of the barn this morning,” she continued. My mind was suddenly filled with an image of a broken down stall, and my colt happily roaming the property getting into Lord knows what kind of trouble. I tried to figure out how I could explain a return home to my boss, when we had a full day slated for team building activities. The new boss wouldn’t be happy if one of his leaders missed this day. I tried to calculate what solutions would suffice to get mom and the horses through the day in my absence. While still on the phone (she has a headset), my mother got his halter and easily caught Noble. Well, as tall as he is, haltering is never easy – but he cooperated. She reviewed the damage, and it was relatively minor. You see, my too-smart colt has recently learned undo the clip on his stall. We had another such adventurer in the past, so every stall also has a chain across the front. This he had broken. I can picture the scenario – playing with the clip, finally getting it undone, and the stall door flying open. In spite of his general juggernaut approach to life, he’s been pretty respectful of not barging through the chain. However, he likes to reach under and nibble any hay that has been dribbled outside his stall. Having watched him snap a 2″x6″ board with his neck, while reaching through to some grass on the other side, it’s not hard to imagine what happened to the clip holding the chain. Once free, he apparently made quite the tourist of himself. Mom found an overturned muck bucket outside, items knocked off of a chair outside the tackroom, some manure piles in the aisle, and various other little signs that he’d made the rounds. My favorite, by far, is the manure pile that she found on the pallets where we store hay. First, just in order to get there, he either had to walk through a human-sized door, immediately turning and weaving between a table and two wheelbarrows, then making an immediate other turn between the back of the truck and the hay; or, he had to shimmy through some very narrow passages between the fence and tractor, tractor and truck, or truck and storage trunk. If I had asked him to navigate any of those paths, he surely would have balked! Then there is the simple fact that my 1400+ pound colt actually stood on some rather old, somewhat weak, pallets and didn’t break any or get hurt! A good sign that he’s lighted footed, perhaps? I already spent last weekend repairing Noble damage. First, propping up the front of his stall. We’d moved him to a new, roomier stall with a wider view. He loves it, but has no problem leaning with full force on any wall (all of my stalls have half walls in the fronts, so the horses can see out and talk to each other). He had, in a relatively short time, taken a stall that was just slightly crooked, and basically destroyed its very foundation. I have it once more solid and straight – but for how long? 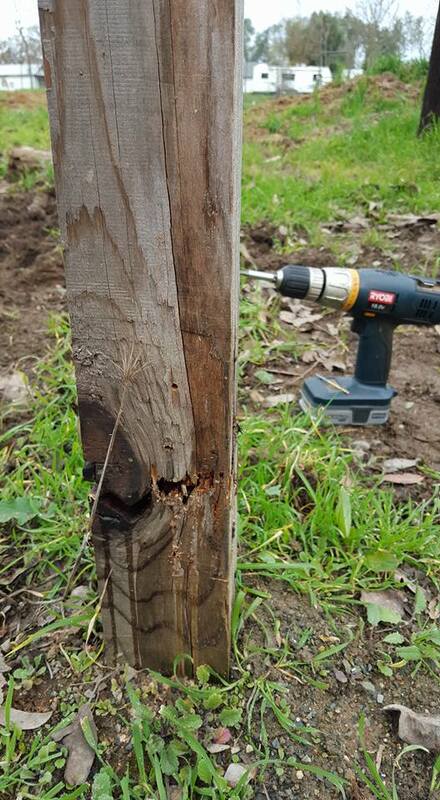 Then, on Sunday, I had to amend a repair to a post he’d broken, because he ran Uncle Java into is and snapped it again! We have lived with a lot of horses over the years, but not since our Mustang, Ricky, have we had someone with so little regard for structures of any kind! “You wanted an old type warmblood!” my mother likes to remind me. “You knew what they were like going in!” She has a point, though I’m loathe to admit it. So, tonight I will be spending my time trying to prevent another overnight roaming by Noble. And I still have to finish fixing the fence I was working on Sunday. It’s just a good thing that I’m completely smitten with that boy! This entry was posted in My Journey and tagged destruction, fences, life with horses, midnight ramble, never a dull moment, Noble, surprises in the morning. Bookmark the permalink. My chestnut mare Phoebe is an offspring of Kalamino. Nice to meet “family”! I went to your FB page – Phoebe is lovely! How tall is she? Noble is just a fraction under 16.2, and won’t turn three until late June … big boy! Love all of the relatives that I have seen … and all seem to have fabulous temperaments.